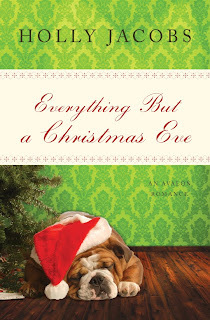 If you want a funny, short, romantic story for the holidays, try Holly Jacobs' Everything But a Christmas Eve. It's a terrific addition to the Everything But... series. Jacobs' books in that series are always warm, and charming, just the perfect prescription for the hustle and bustle of the season. Now that all of Vancy Bashalde Salo's children and grandchildren are married, she's bored. When her best friends suggest she take up matchmaking, she latches on to the idea. And, she knows just who she's going to try as guinea pigs. Eve Allen is the new office manager for Salo Construction, so Vancy invites her to dinner, along with TC Potter, the Salos' neighbor. Vancy doesn't know that Eve ended a bad relationship. She also doesn't know that Eve and TC have a history that goes all the way back to kindergarten. But, Vancy wouldn't care, because she's convinced she's putting two people together who will be soul mates. Eve is the woman who says, "Christmas seemed to be a season when things went wrong for her." And, TC, one of "America's Most Eligible Bachelors," is playing Santa at the mall, and understands the romance behind "The Twelve Days of Christmas." It might seem as if these two people will never get together. But, it's a Christmas romance. It might just take a dog named Bert, and a matchmaker named Vancy Bashalde Salo, but I think there will be a happy ending to Everything But a Christmas Eve. Everything But a Christmas Eve by Holly Jacobs. Avalon Books, ©2009. ISBN 9780803499843 (hardcover), 176p. FTC Full Disclosure - The author sent me a review copy of the book, hoping I would review it. Funny and short sound about my speed today as Christamas approaches! Perfect. Sounds like another good book to check out. Funny and romantic is always good around the holidays. Thanks. What a great cover! Sounds like the perfect holiday read. That's how I'm feeling, Elizabeth. Funny, and a quick read are perfect. You're right, Mason. And, the Everything But... series qualifies as funny, short, and romantic. Isn't that a great cover, Ingrid? One of my favorite for the month.